wanderlust ATLANTA: ELF The Musical is Magical! 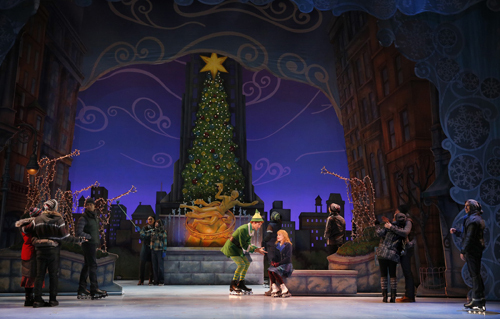 ELF The Broadway Musical is on tour and it's onstage at the Fox Theatre right now! I'm so happy that I got to see this show, one of the many holiday shows slated for the Fox stage this holiday season. It's fun, it's peppy, it's colorful...it's truly magical! The first full-cast number is hilarious! You can't help but don a huge smile and tap your feet...especially when you see the elves' feet. Don't tell anyone, but they're humans who are wearing elf shoes...on their knees. They're brilliant! The elves...and Santa...and Buddy...the entire cast is brilliant! 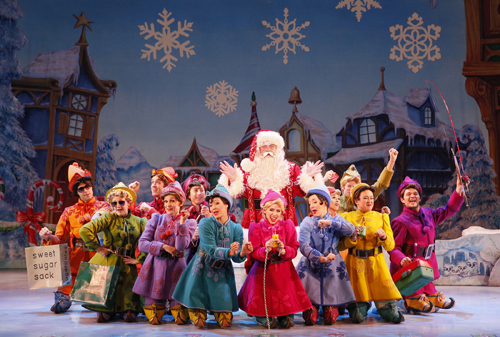 As described by Broadway in Atlanta, "Elf is an original musical that brings to life the heartwarming and hilarious tale of Buddy, an orphan who mistakenly believes he’s really one of Santa’s elves." 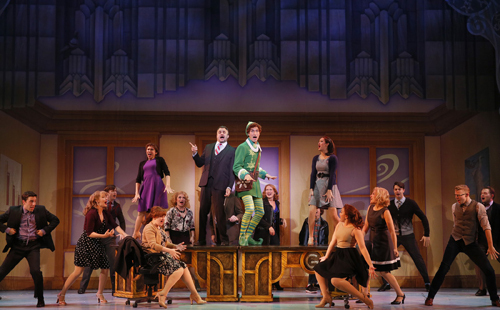 The musical is based on the 2003 blockbuster movie Elf starring Will Ferrell as Buddy the Elf and Zooey Deschanel as Jovie, his love interest. I'd not seen the movie when I was invited to see the musical, but I made sure I did before the performance—I'd heard good things about both. Two nights before seeing the musical I watched the movie (Gotta love modern technology! )...I smiled and laughed and even shed a happy tear. The musical elicits the same emotions, but it brings an additional dimension of humor—the kind of over-the-heads-of-children humor that you see and hear in today's blockbuster animated films. 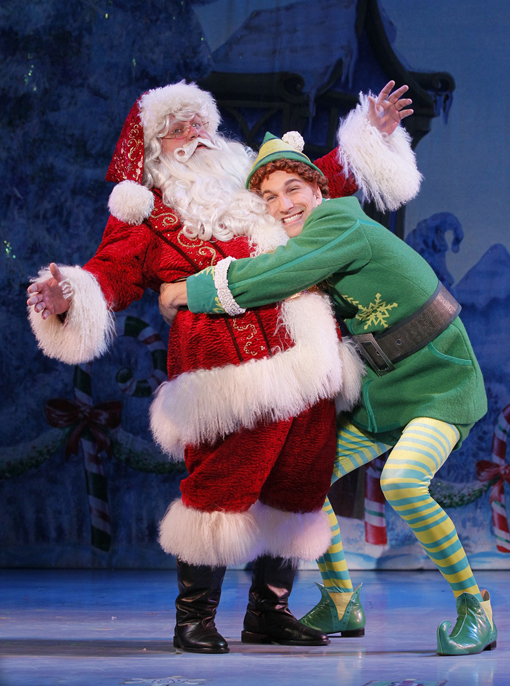 Buddy is perfectly performed by the 6'4" too-tall-to-be-an-elf Daniel Patrick Smith, who has a voice that would make the Sirens jealous and a natural acting ability that, well, landed him the lead role in a touring Broadway holiday show...everyone loves him! Aside from brilliantly performing a contagiously happy elf—Daniel has quite the impressive actor resume. Buddy's love interest—and it was love at first sight—is Jovie, a co-worker at Macy's. Don't worry, you'll learn quickly how Buddy gets from an orphanage...to the North Pole...to Macy's in New York City in hardly any time at all. Actually for him it's 30 years, but for you the trek will be mere minutes. Maggie Anderson, who performs Jovie, is absolutely and incredibly brilliant! And what a beautiful voice! THIS is the reason I enjoy musicals. The script is written, much to my delight, such that the characters—narrator Santa in particular—can interject local events, locales and sports teams. The first mention—think college football—got a huge laugh from the audience! And having visited New York City many, many times, I was delighted to reminisce experiences of places where Buddy and others appear in the story, including Rockefeller Center, Central Park, Tavern on the Green and the Empire State Building, to name just a few. It's been too long since I've been to NYC...I really must visit again soon. Santa, who was...I hesitate to use the word...a secondary character, was for me one of the significant characters in the show...he brought it to a whole other level. 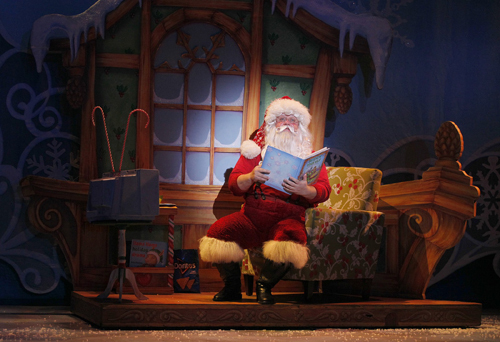 In the movie, the story was narrated by Pappa Elf, but in the Broadway play, the story is narrated by Santa. And this Santa, performed magnificently by Ken Clement, takes stand-up comedy (that was unexpected, but endeared) to a whole other level. A huge, biggest-present-under-the-tree "Thank you!" to BRAVE Public Relations and Broadway in Atlanta for the tickets, but mostly for the experience! I've said many, many times that I write my own thoughts, feelings and opinions...they're not influenced at all, ever, by complimentary tickets, and I'm not compensated for what I write. I love being on media lists, but will never compromise my integrity. I love being a tourist, and a blogger! I'm grateful others enjoy what I share. Now then, some of you may have heard about a technical difficulty that occurred shortly after the show began. At first, I thought the "technical difficulty" announcement was part of the show...then I became concerned for the safety for the cast and crew behind the curtain that the packed house couldn't see. I don't know what happened, and will not venture a guess, but I know what I saw when they returned to the stage. The cast and crew performed...true to their art they demonstrated, in true professional spirit, that "the show must go on". We may never know what happened, but I sincerely hope that the people who made it possible that they could continue are honored and revered for what they contributed that night. From this member of the audience, "Kudos to you, to you and your colleagues and anyone else who made the evening happen! YOU are appreciated!" 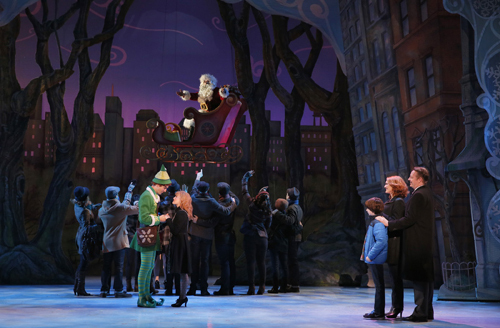 Go see ELF The Musical while you still can. There are only four more performances between now and Sunday, December 6...and what a magical reason to experience the Fox Theatre!